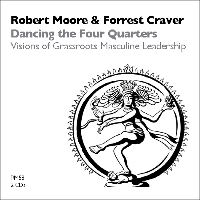 Dancing the Four Quarters: Visions of Grassroots Masculine Leadership is an interview by Robert Moore and Forrest Craver. Recorded in the 1990s, this program addresses masculine empowerment and development of the male psyche along the four developmental lines. According to Dr. Moore, “The masculine psyche is made up of four distinct spaces, what was known in mythology as Four Quarters: the King, the Warrior, the Magician and the Lover. A mature man is a man who is able to embody the concerns that are appropriate to each of these sectors of the male psyche.” Although this program was made in the 1990s, the information contaned within is as valid today as it was then. Men’s work is as important today—perhaps even more so—than it was in the 1990s.